For the rest of this week, I intend listening to On Wenlock Edge, a setting by Vaughan Williams of six poems from AE Housman’s Shropshire Lad. I wrote over the past few days that I was first introduced to the music of Vaughan Williams when I was a 19-year-old and while I was spending some days in Shropshire. I was staying in Wilderhope Manor, a 16th-century Elizabethan manor house on Wenlock Edge, seven miles south-west of Much Wenlock, seven miles east of Church Stretton. 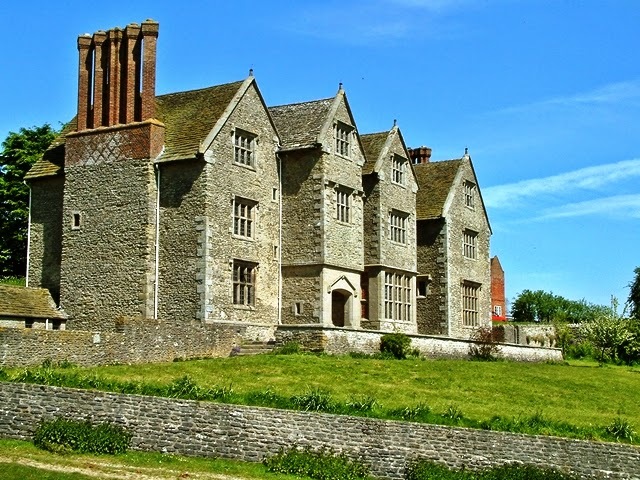 Wilderhope Manor was built in 1585 for Francis Smallman. The house was in a poor state and uninhabited when it was bought in 1936 by the WA Cadbury Trust and opened as a youth hostel in 1937. Many of the original features, including the oaken stairways, oak spiral stairs and plaster ceilings have survived. In the early 1970s, although I had little musical education and no musical background, I was interested in English folk music, and I was enjoying the way it was being interpreted by folk rock bands such as I was enjoying the music of English folk rock bands such as Steeleye Span, Pentangle, Fairport Convention, Lindsifarne and Jethro Thull. That interest drew the suggestion while I was staying in Wilderhope Manor that I should listen to the music of Vaughan Williams, and, as I was staying on Wenlock Edge in rural Shropshire, that I should listen to On Wenlock Edge and read Housman’s Shropshire Lad. This became my first memorable introduction to the great English composers. I spent some time on Wenlock Edge and visiting the neighbouring villages before hitch-hiking back to Lichfield – a journey of about 50 miles. Back in Lichfield, I experienced a self-defining moment in the chapel of Saint John’s Hospital, and was invited for the first time to the Folk Masses in the Dominican Retreat Centre at Spode House, near Rugeley, about six miles north of Lichfield. Ever since, I have associated the music of Vaughan Williams, especially his setting of On Wenlock Edge, with my understanding of my own spiritual growth and development. This morning [2 March 2015], I am listening to ‘On Wenlock Edge,’ the first of the six settings by Vaughan Williams of these poems by AE Housman (1859-1936), published in March 1896. Alfred Edward Housman was born at Fockbury, near Bromsgrove in Worcestershire, on 26 March 1859, the eldest child of Sarah and Edward Housman. His mother died on his twelfth birthday, and the anguished created by this cruel coincidence, led to strong questioning of his Christian faith, although he did not abandon the idea of a God. Housman studied Classics at Saint John’s College, Oxford, and was Professor of Greek and Latin, University College, London (1892), Kennedy Professor of Latin at Cambridge (1911), and a Fellow of Trinity College Cambridge, where Vaughan Williams had been an undergraduate from 1892 to 1895. He died on 30 April 1936. In reacting to the Boer War, in which his brother Herbert was killed, Housman also anticipated the horror and futility of World War I, and his poems would find fresh relevance of with the outbreak of World War I. His landscape is a mythical, idealised Shropshire, similar to the Wessex of the novels of Thomas Hardy. His dominant themes are love, and a post-industrial pastoral nostalgia, infused with expressions of disillusionment at the sacrifice of the young soldiers going to war, never to return. A younger brother, the author and playwright Laurence Housman (1865-1959), first worked as a book illustrator, and the first authors he illustrated included the poet Christina Rossetti. Laurence Housman also wrote and published several volumes of poetry, a number of hymns and carols, and socialist and pacifist pamphlets, and he edited his brother’s poems which were published posthumously. In 1945, Laurence Housman opened Housman’s Bookshop in Shaftesbury Avenue, London, founded in his honour by the Peace Pledge Union, of which he was a sponsor. In 1959, shortly after his death, the shop moved to 5 Caledonian Road, London. I was first introduced to Housman’s in 1976 by its co-founder and manager, Harry Mister, after meeting him with Bruce Kent at the Hayes Conference Centre in Swanwick that year. Housman’s Bookshop remains a prime source of publications on pacifism and other radical values. Vaughan Williams composed On Wenlock Edge – a cycle of six songs for tenor, piano and string quartet – in 1909, a year after he had spent three months in Paris studying under Maurice Ravel, the French composer, who was three years younger than him. The first performance took place in the Aeolian Hall in London on 15 November 1909. In the 1920s, Vaughan Williams made an arrangement of On Wenlock Edge for full orchestra that was first performed on 24 January 1924 by John Booth, with the composer conducting. Vaughan Williams preferred this version to his original. In the accompaniment of the first song, ‘On Wenlock Edge,’ the strings are flaring and quivering in powerful simulation of the gales that trouble Wenlock’s woods, and the emotional gales that have troubled the life of humanity since time began. Vaughan Williams’ approach to the text works on two levels – that of word-painting, and that of bringing out the meanings inherent in phrases or in an entire text. In this first song, for example, he paints words like “high” and “gale,” and depicts the sense of foreboding in phrases like “the wood’s in trouble” and “His forest fleece the Wrekin heaves” in the accompaniment.